Drywall repair is something everyone needs at one time or another. Whether you have rambunctious kids or you just removed art or shelving, you can get holes and dents in your drywall. IncePector Handyman can help with drywall patching and repair in cities all over the Denver, CO metro area, including Aurora, Centennial, Lone Tree, Littleton, Parker, Highlands Ranch, Castle Pines, Cherry Hills and more. First, matching the texture of the existing drywall is very important. The texture should be blended well with the surrounding texture in order for a seamless look. Drywall textures are most commonly orange peel or knockdown. Within each type of texture, the application may range from light to heavy. Specialty textures may be difficult to match exactly, so please ask about your specific application. Second, the paint touch-up is also critical for a successful repair job. Depending on the paint color, age of existing paint, light exposure and other factors, spot touch-ups (especially with the original paint) most likely will not match exactly. For a perfectly even look, we recommend priming and re-painting the entire wall/ceiling where the patch is. Here is a quick overview of the drywall repair process, so you can understand exactly what to expect. First, we prepare the work area so that any furniture, carpet, valuables, etc. are covered for protection. Even though we go to great lengths to cover and protect your things, drywall dust will always find its way onto surfaces. Unfortunately, this is a by-product of any construction project! After that, we will cut out the damaged portion of drywall to make a clean area to work with. Generally, this means cutting a section that is a little bigger than the damaged area. Then we fit a new piece of drywall into the damaged area. Next, we tape the seams and apply “fast drying mud” to them and let that dry. After the mud dries, we sponge the seams so they are nice and smooth and ready for texture. Texture is applied with a hopper to get a consistent look. Texture in a can does not have the same texture or look as texture applied using a texture gun or a hopper. In many cases, original texture is applied from a truck with a large hose and texture gun. We then let the texture dry for about 24 hours before painting. 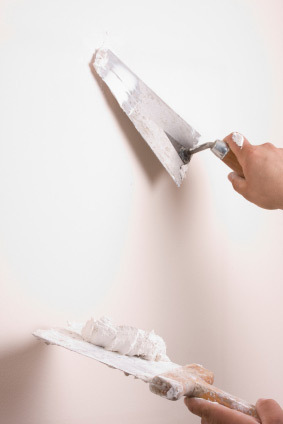 It is recommended that priming is done before painting so that here is no “flashing” of the drywall through the paint. This means that you would clearly see the area that was repaired if priming is not done first. As previously stated, the entire wall/ceiling should be painted for a seamless look. When the repair is complete, we will remove all protective coverings and vacuum if needed doing our very best to minimize cleanup for the customer.